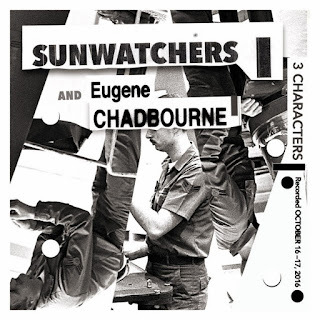 Il fugace incontro di Eugene Chadbourne con i newyorkesi Sunwatchers di due anni fa vede la luce oggi in un album dedicato per intero ai repertori di Doug Sahm, Henry Flynt e Minutemen, con solo una breve deviazione ayleriana e l'imprimatur dello stesso Mike Watt: 3 Characters, doppio vinile che Amish Records promuove con intento addirittura etico: "Sunwatchers teamed up with Eugene Chadbourne for two days of recording in October 2016 which resulted in 3 Characters. These sessions were dedicated exclusively to the music of the Minutemen, Doug Sahm and Henry Flynt. Having never played together before, all the songs were completed in one or two takes and the recordings reflect an urgency and immediacy that audiences have to come to expect from these musicians. The three characters invoked on these recordings offer models for our current political and societal struggles. Creating a music that is both personal and political, artistic and activist, these three figures were/are soulful and practical examples of the artist-as-laborer, addressing a call for social justice and musical spontaneity. Chadbourne and Sunwatchers have taken up this struggle, touring and recording, writing and collaborating, throughout their respective careers. Pushing this ethos out into the field and on this recording, 3 Characters is a reverential labor of love, where musical labor becomes a form of both love and resistance. Mike Watt joins the conversation with spoken interpretations of lyrics, poetry, speeches and assorted agit-prop. Having Watt's contemporary voice alongside so many songs that he wrote and defined suggests this, and all artistic collaborations, function as part of a long continuum that inform future callings."